For an authentic taste of Foley and the Alabama Gulf Coast, go where the locals go. These locally owned or family-owned and -operated Foley restaurants offer something for every appetite. Lunch – For a great selection of sandwiches, paninis and Italian entrees, visit Gelato Joe’s. Order up a Sweet Strawberry Salad with spring mix and fresh strawberries, topped with blue cheese and roasted pecans, for a light lunch – and save room for dessert from the restaurant’s large selection of gelato flavors. Dinner – When seafood is calling your name, put Fish River Grill II on your radar. This down-home, casual spot serves up Cajun pistols, fried oysters and swamp soup. If you don’t know what swamp soup is, that’s all the more reason for you to cruise into Fish River Grill II. Dinner – For savory Italian dishes that’ll make you want to come back again, you can’t go wrong with Foley’s Portabella’s Restaurant. The La Pasta with Italian sausage, smoked sausage, peppers, onions and marinara served atop penne pasta is a locals’ favorite. Brunch – Specialty teas and coffees highlight a delicious brunch at The Copper Kettle Tea Bar in downtown Foley. No matter if you take your tea hot or cold, the local loose-leaf tea specialists at The Copper Kettle will help find the perfect blend for you. Enjoy fresh soups, Greek hummus and tea house salads for a light brunch to start your day. 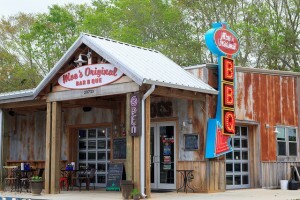 Lunch – For south Alabama barbecue served up right, head to Moe’s Original Bar B Que. Their Southern soul food revival dishes will have you licking your fingers and loosening your belt. Dinner – Family owned since 1959, you’ll find some of the best seafood and casual fare at Captain’s Choice, located inside Gulf Bowl. Oysters Rockefeller will rock your taste buds and the honey grilled shrimp with cheese grits will have you licking your plate.